Fight other players with confidence with our Sea of Thieves PvP tricks and tips. Fighting skeletons and fending off a kraken all pale in comparison to fighting other players in Sea of Thieves. Another player will use tactics you haven’t thought of, they’ll fight dirty, and they’ll do whatever it takes to come out on top. If you want to become the best pirate to sail the ocean, and win every fight against other players, you’ll need as many Sea of Thieves PvP tips as you can get. 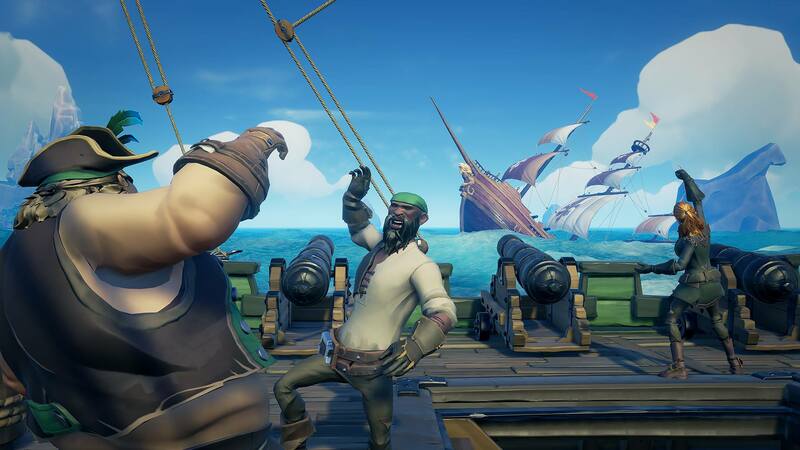 Whenever you come up against another player in Sea of Thieves, you’ll want to ensure you know every trick in the book before firing your first shot or taking the first swing of the cutlass. 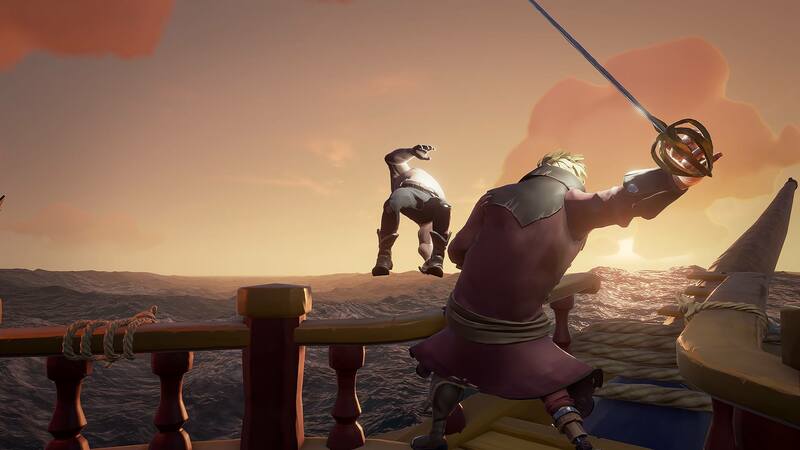 At first glance, the combat in Sea of Thieves might seem simple, but when taking into consideration all the weapons, movement, and ship-to-ship combat, it becomes a complex dance. There are several main areas which you should focus on when fighting other players in Sea of Thieves. You will need to ensure you know what to do when engaging in ship-to-ship combat, from what to do with the sails to how to shoot your cannons. And when you fight someone face-to-face, you’ll need to know how to handle each of the weapons. Before you set out on an adventure, stock up at the island you spawn on (most likely an outpost), and then resupply on your way to your goal. Ideally, you will want to never enter combat with another ship when your ship has the standard amount of supplies. Additionally, in order to increase the amount of supplies on the ship, always unload all cannonballs, planks, and bananas before landing on an island, this frees up space to collect more resources. As for actually engaging in ship-to-ship combat, everyone should immediately fill their inventory with cannonballs, planks, and bananas before you get in range of another player. Doing this avoids awkward situations where you have no cannonballs with which to use against another ship. When you do engage in ship-to-ship combat, the ship doesn’t go on autopilot – you must still attend to the sails. It’s a good idea to raise the two front sails completely and just use the rear sail for propulsion. Sailing with a single sail will ensure you have maximum maneuverability. In the event you are being pursued, do not be afraid to perform a handbrake turn. Doing this successfully requires excellent coordination of your team, as keeping the anchor down for longer than necessary ensures you lose all advantage of a sharp turn. Have the wheel locked one direction and then drop the anchor. As soon as the anchor hits the ground, all hands should begin raising it in order to set sail immediately. When done correctly, you should make an impressive 180-degree turn, or even a half-turn to broadside a pursuer if your wheel isn't locked. When you are actively pursuing another ship in an attempt to reach them, it is essential that everyone keeps on top of the sails. Catching the wind 100% of the time will mean the difference between catching up to your prey and letting them slip away. Unless you can get a gunpowder barrel to an enemy vessel, the only way you’re sinking another ship is if you can pepper them full of holes using the cannons. The cannons can be difficult to use, especially when moving at a high speed and when your target is far away. It’s crucial to learn the angles of the cannons, either by practicing when you have an excess of cannonballs, or by using your captain as a “spotter” to tell you when you must aim higher and/or lead the target more. A good way to do this is whenever you “enter combat” with another ship, begin angling the cannons for a hit whenever possible. Leave the cannon angled after your last shot and watch the cannonball drop down and see where it lands. Alternatively, continue blasting shots, waiting a couple of seconds between firing to watch the cannonball and wait until one hits – this should help you get a “feel” for the right angle. 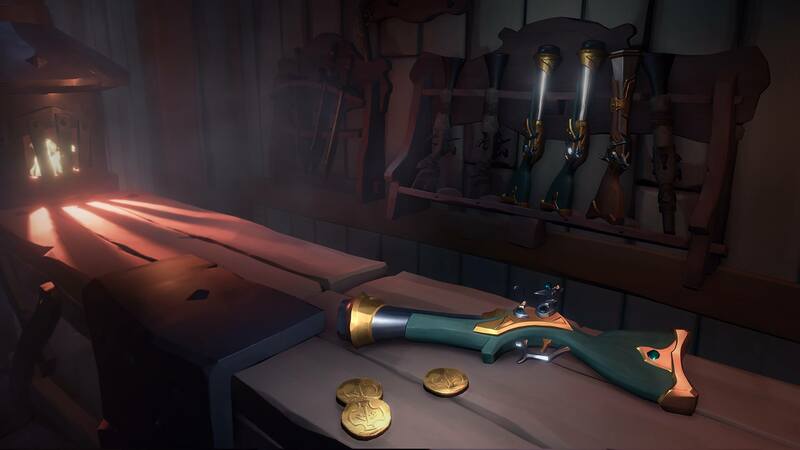 Out of all the weapons available to pirates in Sea of Thieves, the cutlass is one of the most versatile tools for PvP. The sword never runs out of ammo, it can be used for movement, for defence, and for attack. The cutlass has a few main moves: attack, block, 3-hit combo, charge attack, and dodge. That’s right. You can dodge when using the cutlass. To do this, simply hold block and then move in a direction and press jump, you will hop a small distance, easily sidestepping blunderbuss shots and closing the gap. The 3-hit combo is exceptionally powerful, knocking enemies back and whittling down their health. However, if one of the hits doesn’t connect with anything (player or environment) you will suffer a penalty and become “tired” for a few seconds. If you think one of the hits won’t connect, try to hit anything around you. The charge attack is another useful move that allows you to deal huge amounts of damage to an opponent during PvP combat – just make sure you hit. If you miss a charge attack, you’ll become “tired” for several seconds, rendering you completely vulnerable to attack. The charge attack is also excellent at propelling you through water at high speeds. To do this, simply position yourself above water (either on a rock or pier), perform a charge attack, and then watch as you zip through the water. While it took a slight nerf to damage recently, the Sea of Thieves’ blunderbuss is still a fearsome weapon in the right hands. The pirate-equivalent of a shotgun, the blunderbuss will one-shot an enemy player if fired at point-blank range. As for the flintlock pistol, it is painfully accurate at all ranges bar long range. This pistol also deals a decent amount of damage, and when paired with the blunderbuss, can very easily dispatch an enemy before they can reload. A good strategy is to use one weapon followed immediately by another, then retreat and reload regardless of whether the player died. If the player is distracted, get in close with the blunderbuss so as not to give them a heads-up you’re close by. Though you’re limited to 5 rounds per weapon, nearly all places you fight other players will have ample ammo crates for you. Fight near ammo crates when clearing a skeleton fort or on the middle deck when fighting on a galleon. 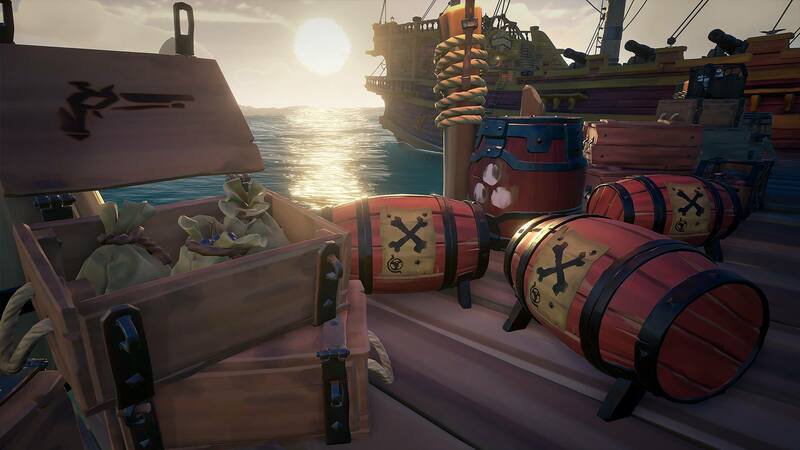 The gunpowder barrels, or explosive barrels, in Sea of Thieves are one of the most devastating offensive items a pirate can use. A well-placed explosive barrel can fill a galleon with holes and kill an entire crew in a single moment, but using them can often be a challenge. 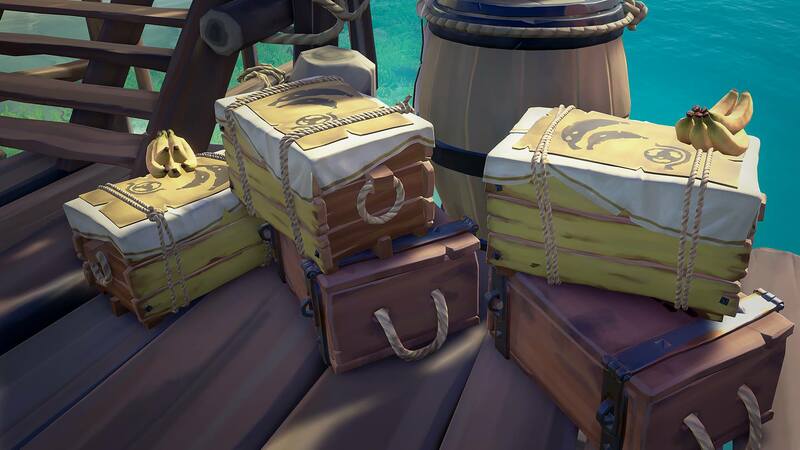 As you set out on your voyage, take a moment to visit a skeleton fort and collect a couple of explosive barrels. These will be for combat, not to be sold to help rank up faster in Sea of Thieves. You can set off a gunpowder barrel either while in an enemy ship or when swimming below. Obviously, setting an explosive barrel off while inside the ship gives you more control of the situation as you can kill any straggling enemies. To do this, you will need to get in close to an enemy ship by either swimming to it or boarding it after a ram or when they get close. Take the barrel as far below deck as you dare, and shoot it to cause an explosion. Alternatively, you can swim beneath an enemy ship while holding a gunpowder barrel and then let it go. When a gunpowder barrel that is not being held by a player comes in contact with a ship, it will immediately explode. A good strategy is to drop one behind you when being pursued or send a crewmate overboard while holding one to deliver it with more accuracy. There’s always more to learn in Sea of Thieves, especially as Rare continues to update and support the game post-launch. Whenever you fight another player in-game, it’s important to not only have in the back of your mind all the options available to you, but what your opponent might try as well. Did you just ram an enemy ship? Well they might try to drop your anchor and flee. Chasing a ship? Keep an eye on your ladders in case someone went overboard to try and kill your crew. Be sure to read through our Sea of Thieves guide as we continue to cover different strategies and tips you can use in-game!